Craziness is in vogue these days, and RTG, the slot manufacturer, keeps a careful eye on current trends. 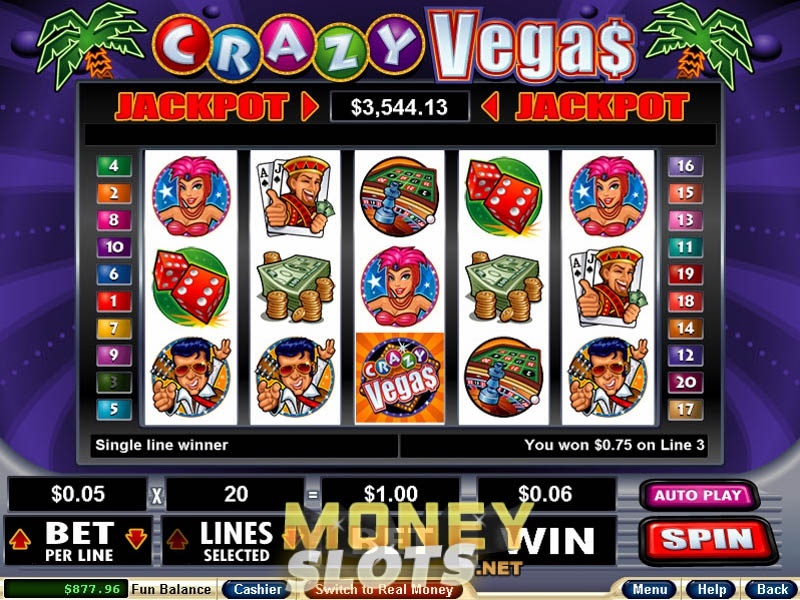 The slot is all about insane gambling, big-time winning and other atrocities to which you, gamblers, are so addicted. In fact, you are viewing the whole of your life in front of you, aren’t you? Crazy Vegas is definitely one of the least successful slots that won’t bring you anything but disappointment, financial loss and lots of headache because of hysterical icons continuously flashing on the screen. Yes, it operates a traditional scheme of five reels and twenty paylines. The denomination range is good enough, starting with a humble one cent and finishing at five dollars. But the main downside is the jackpot. We don’t think that anyone with serious intentions about gambling will risk the maximum betting value to hit 300 coins at most. If there are such guys – let us know!